USDJPY is chiefly under the influence of the central bank and the Fed decision regarding the rate hikes. The support rests at 106.100 with resistance at 106.560 which the weekly pivot point at 106.280 is located in between the lines. 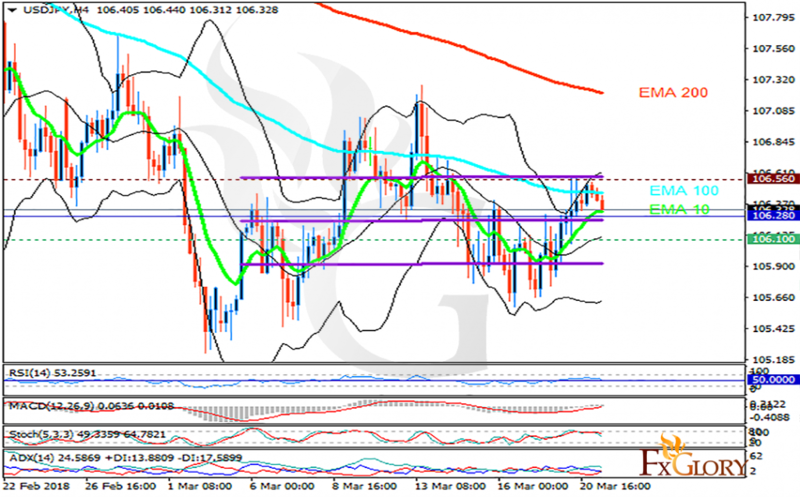 The EMA of 10 is moving with bullish bias in the horizontal channel and it is below the EMA of 200 and the EMA of 100. The RSI is falling towards the 50 level, the Stochastic is showing downward momentum and the MACD indicator is in positive territory. The ADX is showing weak buy signal. USDJPY will be fluctuating within the Bollinger bands however, if we only have 3 rate hikes this year, the pair will most probably decline towards 105 area.